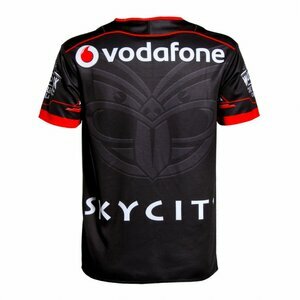 Our updated 2016 Vodafone Warriors Home Jersey is emblazoned with our stylised V fern design, stamping our position as the only New Zealand team. 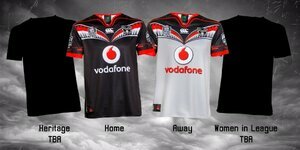 We also have a special black and silver NZ version of the NRL Telstra Premiership logo and the matching Vodafone Warriors logo embroidery on the left chest. 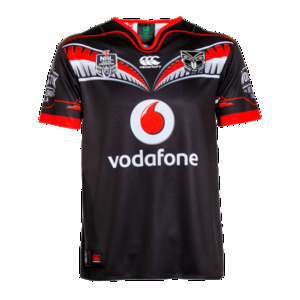 This jersey is a replica of what your team will be wearing at the majority of our home games for the 2016 NRL season. Strong mesh fabric to wick away sweat during tough games. 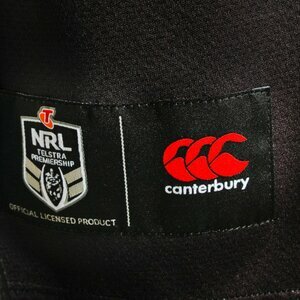 High quality logo embroidery on the chest. OFFICIAL REPLICA - Same design as the 2015 home jersey but slight changes to the neck area. The collar has a red trim while the red piping wraps around the neck but disappears from the armpit area. The fern and Vodafone logo sit higher. 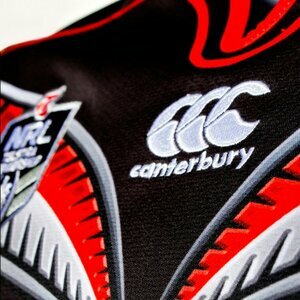 Another big change is the usual black Warriors logo in place of the Warriors 20th Anniversary logo.